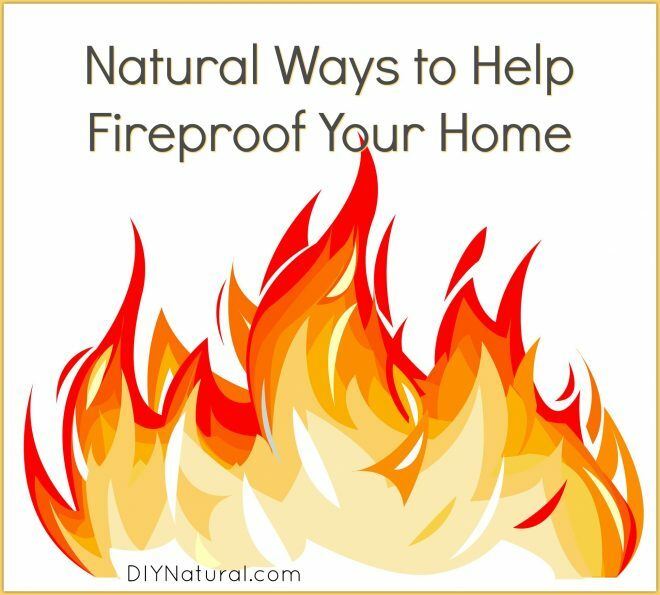 With all the wildfires we’ve had recently in Western North Carolina, it got me thinking about how I can protect my home. There are fire retardants on the market that may help if you should be in the path of a fire, but these are made with noxious chemicals, and who knows what is really in them. Here are some natural solutions. While fire is a natural way for nature to get rid of litter on the forest floor or on a prairie, it can be scary if it comes near your home. Start by looking at your yard. Remove any dry vegetation. In the spring and fall especially, there can be a lot of dead weeds. If they can’t be removed, at least thoroughly wet them down. Pay attention to your foundation plantings. If you have conifers (pines or firs), you might want to move them or at least trim branches up off of the ground. Conifers contain sap that is highly flammable and can add to an already raging fire. Consider using fire resistant plants near your home. Some fire resistant plants are Eastern Redbud, Live Oak, Sycamore, Yucca, Agave, Salvias, and Lavender. Not all plants are suited for all areas, so be sure to check your zone to see if these plants will grow in your area. Check your lawn. Most lawns will go dormant in the winter, leaving dry grass on the surface. Keep it cut short and water well if there is a fire in your area. Wet down the roof. Flying sparks and embers can grab hold of your roof easily. If it is wet, this will help to extinguish flying sparks. Wet down any wood on the outside of the home. In a fast moving fire, this can help to keep flames from catching on wood. This includes doorways, window frames, decks, and porches. Don’t just spray over the top – wet them down thoroughly. Consider tile or metal roofing when/if replacing a roof. Both of these resist fire. They can be expensive to start, but they last for many years. Consider using brick or stone for your home’s exterior. Cedar shakes might look great, but are very flammable in a fire. At the very least, finish the bottom part of your home in brick or rock. Use fire retardant paints. One very simple fix is to add sand to the paint. You will have a rough texture, but it may help save your home. Check your smoke detectors. If a stray spark should hit your roof and take hold, a smoke detector can save your life. Change the batteries at least twice a year and test them once a month. The smoke detectors in my home are “daisy chained” meaning if one goes off, they all go off. This can be helpful in a large home. Get a fire extinguisher. If sparks are present, you can put them out right away. Pick up any trash around your home. An empty cereal box that fell out of the trash can is perfect for keeping a fire going. Keep them in the trash or recycling. If fires are nearby, move your lawnmower and fuel to the garage or basement. This could be a very dangerous thing. If you don’t have a place to store them, move them away from the house. An explosion could occur from the gas if a fire would come in contact with it. Be careful where you smoke. If you do smoke, be sure to put your butts out completely before tossing them. An old can with sand or water works well. Don’t use barbecue and fire pits if the weather is very dry. Take photos of the inside and outside of your home. This can help with insurance claims if a fire should strike. If there is a chance you may need to evacuate, get things ready ahead of time. Get your emergency kit ready. This will help in case you need to move quickly. Pack a small bag with clothes, medications, and anything else you may need. Get packs ready for your kids and pets too. Plan where you’ll go especially if you have pets, as many shelters won’t allow them to stay with you. Brother Wolf, an animal shelter in our area, is taking pets right now to ease the worry of people who need to evacuate. Put important papers in your car and be sure to keep the gas tank full. During crisis situations, there are always long lines at the pumps. Keep an emergency phone list handy and keep your cell phone charged. You never know if you may need to call your boss and let him know you won’t be in, or your dad to let him know you’re safe. Consider investing in a solar phone charger (like this). I have one that works great, and I don’t need to worry about ending up somewhere without electricity. Make sure the water is on and the hose is hooked up. If you get a call to evacuate in the next few hours, you’ll want to be sure the water is turned on and the hose is not locked in a shed. It seems simple to think these are handy, but if fires are in your area, be sure! Not everything is foolproof. If a fire is hot enough or burns in an area for a long time, none of these measures may help. Of course, it goes without saying…if you’re in the path of a fire, get out! Your life is more valuable than your home. These precautions should be taken well in advance of an approaching fire. These are just some of the ways to keep your home safe in case of a wildfire. Can you think of others?